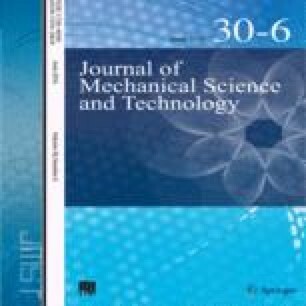 In this paper the dynamic analysis of the Macpherson strut motor-vehicle suspension system is presented. The equations of motion are formulated using a two-step transformation. Initially, the equations of motion are derived for a dynamically equivalent constrained system of particles that replaces the rigid bodies by applying Newton’s second law. The equations of motion are then transformed to a reduced set in terms of the relative joint variables. Use of both Cartesian and joint variables produces an efficient set of equations without loss of generality. For open chains, this process automatically eliminates all of the non-working constraint forces and leads to an efficient solution and integration of the equations of motion. For closed loops, suitable joints should be cut and few cut-joints constraint equations should be included for each closed chain. The chosen suspension includes open and closed loops with quarter-car model. The results of the simulation indicate the simplicity and generality of the dynamic formulation.